Before Durga Puja I was wondering if there will be any activity in Nairobi. I was sure that Navratri will be a colorful affair. So I started enquiring around about Durga Puja. And before I knew it, I had the membership form of the Bengal Association. 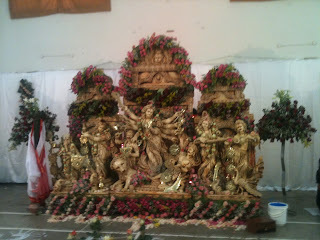 Puja is very much celebrated here and the association is thriving. I am told that three original families that came with British railway project are Mitra, Ghosh and Dey – they are the “Aadi Bangalees” of Kenya. After Kenyan independence in 1963, they were given a choice on citizenship and decided to stay in Kenya. Today on Saptami day, I went to see the Puja for myself with a Bengali friend. Needless to say, the venue was in Parklands area (Wahindi hub of Nairobi): Maharastra Mandal. The floral decoration was very tastefully done - using the abundant and fresh bounty of the land (who cares if the flowers are not the traditional ones, the roses looked lovely). The Pratima was from last year from Kolkata, a donation from some body. Since I went there in the afternoon time (best suited from baby, safety and car logistics point of view), we saw mostly ladies and elderly gentlemen. It felt like a homely and welcoming Pujo. Bengali saris were on display all around, not sure how people would have got them (I assume the source would be the back and forth travellers between Nairobi and India). There was arrangement for Bhog complete with all the traditional courses of Khichudi, Labda, Tometor Chatni and Payesh; it tasted really good. Cultural programmes are planned for the three nights - I would have loved to attend them but for the late timings. There are events planned for Bijaya Sammelan and Laxmi Puja as well. Updates from Ashtami & Navami visits: The puja performed is a Hindu puja, not the Bengali puja since there is no Bengali priest in Nairobi, I assume none across Kenya. But this does not dampen the Nairobian Bengali spirit in any way. The Bhog on Ashtami & Navami consisted of different delicacies from North Indian & Bengali cuisine. I am looking for bengali associations in Nairobi and Mombasa. Thanks for providing this info. I searched durgapuja nairobi and bumped into your page. I am looking to connect with any local Bengali in Nairobi as my wife is heading there for a short trip in May on a humanitarian project. Are you in facebook? Couldnt see any contact link in your pages other than this. I have just come to Nairobi. I hardly know anyone here. How does one get a membership to the Bengali Association? I have just come to Nairobi....looking for the contacts from BENGALI ASSOTIATION. There are in fact two Durga Pujas organised by Bengalis in Nairobi. One of them is at Maharashtra Mandal, Parklands and the other is at Sai Temple, Ngao road (off Kusi lane), Parklands.